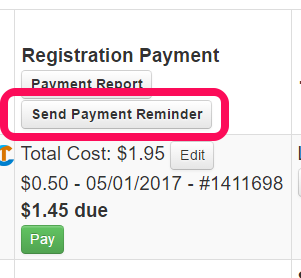 Late last week we released some of the most requested upgrades from users last year for taking and managing registration payments. A lot of our clients do not use event registration. So, to help, let me ask, "which of these categories best describe you?" We use another software (or none) for events. In your case, imagine all your data in one place. You've already paid for Churchteams, so why pay for another service? Or, maybe it's time to move away from all those paper registrations. Here's how to use CT for events. Create registration form. In the group/event click Edit then Registration settings. Embed the link. On the top of the Registration Settings page is the link you need to embed in your website, email, text, or post. 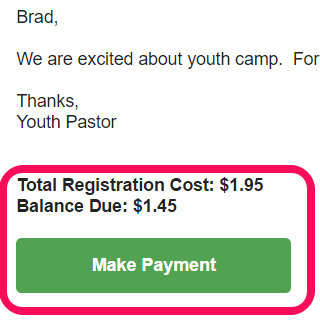 We use Churchteams for events, but not payments. You can link an event to a third party payment service, but then you have to manage the event in two locations. Add payments to your event by signing up for online giving. When it is set up, all you have to do is add in a payment amount and then manage everything on one page. Your staff will love this! We already use Churchteams for events and payments. The new update includes two major upgrades. You no longer have to create registration attributes to give people options for making deposits or multiple payments. 2. Amount due reminders. We added a great new feature that allows you to send an email and text to everyone with their amount due and a link to pay included in the email/text! This is a HUGE time saver! Whichever one of these you are, I want to invite you to join Mark (Software Architect), Bryce (Payment Partner) and me for a 15-30 minute Brief: New Registration Best Practices webinar this Thursday or next Monday.